F1 is poised to re-establish its French connection it seems. Following on quickly from the long overdue return of French drivers to the sport this year (and no fewer than three of them), the equally long overdue return of a French race sounds imminent. France is the country of motor sport's very roots. The first ever organised motor race took place there in July 1894. Such races eventually became Grands Prix and Grandes Epreuves (the use of the French lexicon isn't coincidence), which in turn eventually became Formula One. And a French Grand Prix appeared on the F1 calendar every year aside from 1955, when it was cancelled in the wake of the Le Mans disaster, seeming to be part of the furniture. But after 2008, after years of threatening by Bernie, the unthinkable happened and the French round was dropped for the 2009 season. F1's itinerary has stepped away from its heritage and core support notably in recent times - and surely the dropping of the French round is the most egregious. But the issue of the French round's return has moved on in recent days ever so slightly. France's Prime Minister Francois Fillon, himself a motor racing man - he's on the committee of the Le Mans 24 hour race and has competed in the Le Mans legends sports car race - visited the Paul Ricard circuit last week. And while the actual confirmation of the returning French Grand Prix that many anticipated was not forthcoming, it did sound like it isn't far off. Fillon's utterances indicated that money is in place and Bernie is on board, with only a small and surmountable gap in finances to be bridged. It also seems that alternation of the race with another venue (most probably Spa) is how the race will be scheduled, and that the race's venue will be Paul Ricard. Of course, when a new race is added to the calendar these days we're used to a gleaming new facility, built from scratch, to be its home. But Paul Ricard is far from new. Indeed, it has held the French Grand Prix no fewer than 14 times, on and off between 1971 and 1990, and its layout now is largely unchanged from when it opened. And judging by the content of articles and discussion forums on the matter of its return, many recall the venue with affection. Perhaps it says something about how perspectives change over time, as a dig through contemporary accounts show that Ricard's popularity first time around was by no means universal. When Paul Ricard debuted as an F1 stop-off in 1971 it was very much the Abu Dhabi of its time, with all that entailed. Paul Ricard the person was a south of France local who'd made a lot of money in the drinks business (particularly with an aniseed drink called pastis that he invented and which became very popular) and, after building his own aerodrome in 1962, he turned his attention to building a racing circuit next to it in 1969, named after himself. The venue opened with a sports car race in 1970, and the next year it was hosting F1 for the French Grand Prix. Just as Abu Dhabi was to do almost 40 years later, the forward leap it represented in venue design and facilities was stunning. Its three-story paddock building was all shimmering glass and clean white concrete, and featured spacious garages, an air-conditioned press room, hospitality suites and many other facilities. This remember was an age wherein many venues had facilities so rudimentary that cars were worked on by mechanics in the open air, and the paddock amenities, such as they were, were under canvas if you were lucky. The Ricard venue was also a massive step forward in the safety stakes, lined entirely by armco and with many generous run off areas. Most remarkably, the first Grand Prix there in 1971 featured lights suspended over the track to be used by the marshals to signal to the competing drivers in lieu of the usual flags - more than three decades before such a feature became de rigueur at an F1 venue. But on the flip side, just as with Abu Dhabi many viewed the facility as somewhat soulless, with a deficit of character and challenge. This was no doubt amplified by the fact that Ricard was taking over as the French Grand Prix venue from the classic, scenic and challenging road circuits at Reims, Rouen and Clermont-Ferrand that had been used in recently-preceding years, and which could have easily been taken right from the sport's early days. 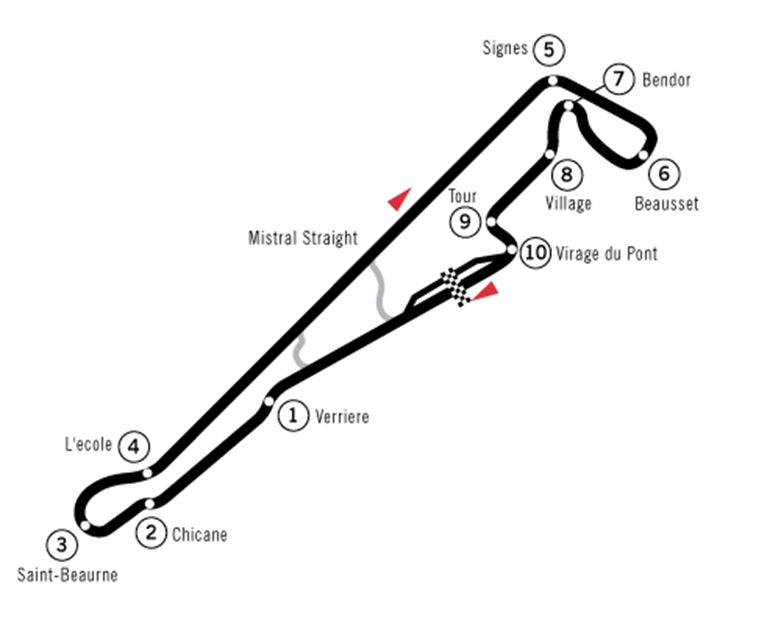 And while the Ricard track had a very high average speed that was mainly due to two long straights which dominated the place, particularly the Mistral (named after the wind that often blew along it - and could make car set-up a nightmare), and many of the corners were tight and technical rather than for the brave. The track was built on a flat, somewhat lunar, landscape (M. Ricard managing to find about the only such expanse for miles around it seemed) and, as John Watson was later to comment, 'dragging them in from the beach wasn't easy', meaning the atmosphere usually was far short of that at other venues such as Monza. Nigel Roebuck commented on Ricard some years later: 'The first time I went to Ricard, in 1971...the track had been built only recently, and was considered a bland 'safety' autodrome, with huge run-off areas and so on. It was seen as a circuit without a soul, and to my mind it remains exactly that'. But Ricard had a few things going for it. This included on the track itself. Roebuck again: 'There were a couple of spots - the left-right swerve after the pits and Signes - which made you catch your breath. They were quick, and for the exceptional driver they were very quick'. Jackie Stewart concurs, on the left-right swerve 'S' de la Verriere he commented that 'you lifted for it and went through on tiptoes. It was...one of those places you could really make some time if you got it absolutely right'. And Signes? : 'It was a delicate corner, a very good corner, one of the most challenging anywhere in the world. And if you got it right it was very satisfying'. John Watson, typically more direct, called Signes 'a big-balls corner'. Paul Ricard's geography also ensured that it was a popular stop-off. It was in the south of France, and the race was usually held in July, with all of the trappings that one might associate with that location at that time of the year: sun, the Riviera, Mediterranean beaches, glamorous locals, great food and wine. Most of the fraternity stayed in the picturesque, charming sea front villages of Bandol, Cassis and La Ciotat for the race weekend - as Ann Bradshaw commented: 'It was just holiday time'. And the scenic and twisting road climb from the seafont to the track became almost more legendary than the track itself. Martin Brundle described it as 'a series of switch-backs, hairpins and downhill braking sections; an amazing challenge, so much so on the uphill journey that you would almost be out of breath before reaching the circuit for a day's work' (note this isn't to be confused with the more northerly route from Ricard where Frank Williams had his terrible road accident in 1986, which left him wheelchair-bound). In another parallel with Abu Dhabi, Ricard was also associated with not always producing diverting races. It did provide a couple of memorable ones though. The race in 1973, F1's second visit, was the scene of Ronnie Peterson's first ever Grand Prix win, in the iconic Lotus 72. But the race is also remembered for the young, fast (and a little wild) Jody Scheckter announcing himself to the world, in only his third Grand Prix start. Given access to the latest McLaren M23 for the first time he qualified second and then shot into the lead from the start. And with his car trimmed for straightline speed he showed every intention of staying there, even as a queue of established front runners formed behind him. The race eventually settled down to the two Lotuses, Emerson Fittipaldi and Peterson, attacking the leading Scheckter but making no headway. Then with 13 laps left perhaps Fittipaldi's frustration got the better of him and he tried to take advantage of the backmarkers by diving up the inside of Scheckter at the final turn, Scheckter didn't cooperate and the resultant collision damaged both cars' suspension and put both out. Peterson was thus handed the race on a plate. And the 1990 race was arguably Ricard's best, and so very nearly provided possibly the most unexpected victor in the sport's history. The two Leyton House cars hadn't even qualified at the previous race in Mexico, and after eighteen months of struggle (down, it transpired, to a dodgy wind tunnel) they ditched their designer, one Adrian Newey (a decision that is surely F1's equivalent of Decca turning down The Beatles). But just before he left, Newey bequeathed Leyton House some chassis and floor changes, which brought them right into the mix. Their pilots Ivan Capelli and Mauricio Gugelmin qualified seventh and tenth respectively at Ricard. 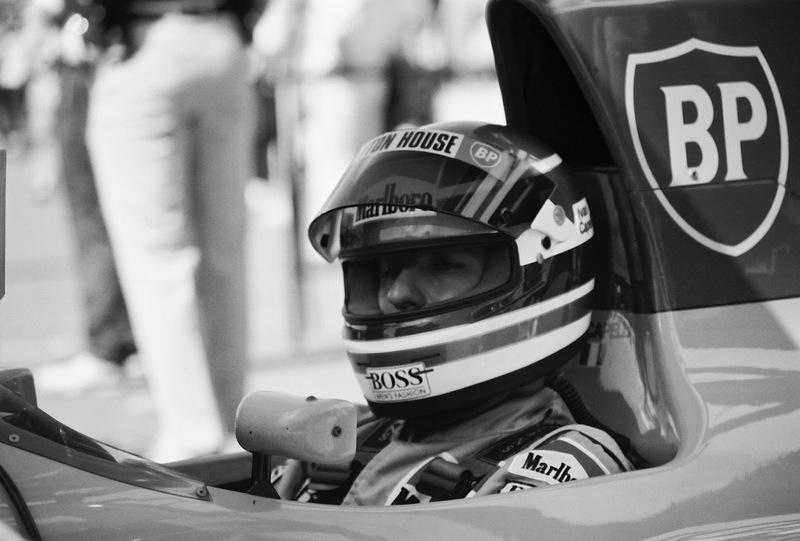 Then in the race they went against convention by seeking to complete the distance without a tyre stop, which catapulted them into first and second places by mid distance - Capelli leading Gugelmin by around seven seconds, with Gugelmin providing rear gunner services holding off Prost's Ferrari. For several glorious laps it stayed that way, before Prost found his way past Gugelmin into second and set about hunting down Capelli (Gugelmin went out with an engine failure not long afterwards). With 20 laps to go Prost was on Capelli's tail, but as with Gugelmin found that getting into a position to pass was not easy. 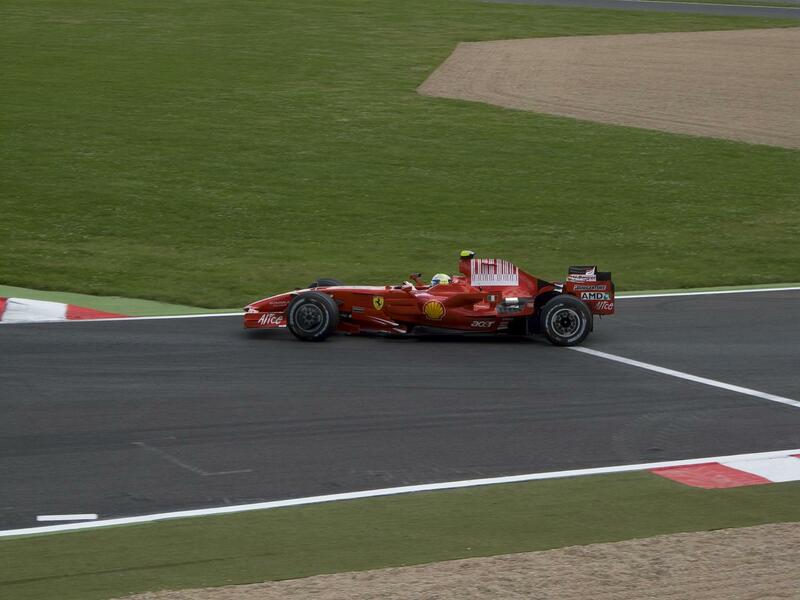 But in the late laps Capelli's machine developed a fuel pick-up problem and spluttered on the right handers. This factor may or may not have helped Prost dive past Capelli on the inside of the Beausset turn with three laps remaining into a lead that he kept. Capelli nevertheless salvaged second place. Ricard also witnessed its fair share of safety difficulties. 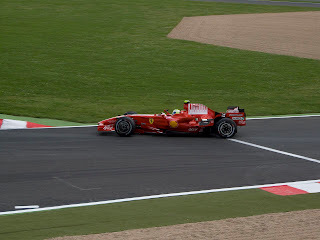 Even the 'safety autodrome' was out grown by the increasing speed of the F1 car over time, particularly in the days of ground effect aerodynamics and the turbo engine. Testing there in 1982 Didier Pironi had a massive smash in his Ferrari, where the car ended up in a spectator section - fortunately empty given it was a test day. And then weeks later there in the French Grand Prix Jochen Mass's March and Mauro Baldi's Arrows got their wheels tangled going into Signes, and the March ended up upside down and on fire in a spectator enclosure full of people. Somehow, no one was killed and the injuries that there were were minor, but it was pure chance that a holocaust, that many feared in the 1982 season with its crazy cornering speeds brought about by the ground effect, had been avoided. And then tragedy ensued in a test session there early in 1986. The rear wing of Elio de Angelis's Brabham detached from the car as he went through the 'S' de la Verriere, and the car catapulted over the crash barriers and caught alight. His injuries from the smash itself were light, but the emergency intervention in place for the test session was definitely inadequate. The marshals were few in number, mostly were not wearing fire proof gear, as well as only had small extinguishers and seemed ill-trained in how to use them. Further, no helicopter was on site to take de Angelis to hospital. In took several minutes to get de Angelis out of the car and even longer to get him to hospital, and he died from smoke inhalation. 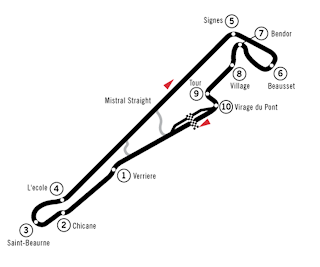 As a result, the Ricard circuit in use for subsequent French Grands Prix was cut almost in half, with the Verriere swerves by-passed. The famous 1990 Grand Prix was to turn out to be Ricard's last, for the moment at least. France's then President Francois Mitterand and his Finance Minister Pierre Beregovoy both had their political power-base in the Nevers region in central France. Mitterand was also close to FIA President Jean-Marie Balestre as well as team owner Guy Ligier, and much public money was thrown at the region's somewhat remote Magny-Cours circuit to bring it up to F1 standards. With all of this against it Paul Ricard didn't stand a chance, and Magny-Cours became the race's new, and rather unloved, home. It all left Ricard to go into a relative decline, the track seeming to be all but forgotten about by 1997. However, salvation came from an unlikely source, when Bernie Ecclestone acquired the circuit in 1999 and transformed it into a high-quality test facility (Ricard was always popular for testing, given its location, climate and accessibility). And in recent years it has started to hold races again, such as for GTs. And the layout it pretty much the same now as in 1971, with a chicane in the middle of the Mistral straight the only major variation. And now we've come full circle it seems. With Magny-Cours unpopular and a mooted new facility near Paris dead in the water, Ricard looks to be the only show in town for the long overdue return of F1's French connection.